In 1980s Essex schoolyards "dapper" became slang for a gentleman's appendage. My favourite from the nerdyshirt website is the "I like Bacon" one. Given the stauton shirt is reduced and the others aren't can we assume it isn't selling. Is it, therefore, the nerdiest shirt of all? Or perhaps it's too cool to sell to normal nerds? Dave Varley used to wear an ADIDAS t-shirt and I always thought it was a bit of a give-away: "Against D4 I Do Any S**t". "Good at chess, bad at life" t-shirts and other merchandise is available here. I like the mug. I can see myself spilling coffee all over me out of that one. So what does your presumptuous t-shirt say, Tom? Does it refer to the wearer as a grandmaster? That looks like a must-have to me. Is it available this side of the Atlantic? I went to an Essex Comp. That's why I can't spell DreAm. They appear to deliver to Europe Justin. Not too expensive. Think I'm going to get the mug. Good of the Penguin to organise the tournament at the same time as the British Championsips. I thought that too (about the Penguin). And didn't the same happen last year (I'm not sure, but I have a vague recollection)? 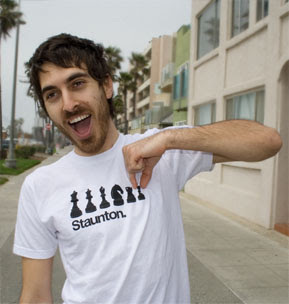 The blurb on the website says "The Staunton society exists to perpetuate the name of Howard Staunton , Britain's only ever claimant to be world chess champion, and to promote uk chess and in particular give young british players the prospects for gm norms and titles". So, how does that fit with running the event at the same time as the British? I was also thinking: how come Adams and Short don't play in the British these days? Well, obviously Adams is playing in the Staunton tournament this year but... well, I wonder where loyalties lie? Presumably if the money was right, they'd both play in the British? I'm sure you're right Tom. I only ever went to the British twice - 1989 and 1990. During the second trip Malcolm Pein did a Q&A whilst commentating on the games. At one point somebody asked him why Nigel Short didn't play in the British anymore (even then!). 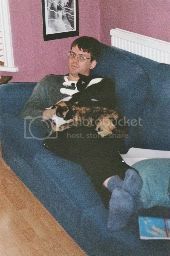 His response was that Nosher's appearance fee would be greater than the budget for the entire tournament. He was joking but the point was clear. Why do you say he was joking? Surely it was just a statement of fact? In Adams' case i reckon it's actually as much about rating as the money. Until perhaps the last few years he played in enough weekenders or one day rapidplays to suggest that money wasn't the only issue. For a player at that level, his rating is enormously important and playing in the British offered huge potential to lose bundles of points. "I'm joking but you get the point." i.e. regardless of whether the appearance fee was actually bigger than the ENTIRE budget for the tournament it was clearly too much for the organisers to seriously consider. Not participation of leading players in a national championship is not, incidentally, a problem that's unique to chess. When British boxers are any good they rarely bother with the British championship at their weight other than as a short term stepping stone to bigger things. I'm sure you're right about Adams and rating points. Holy Moly! The price of the t-shirt just went up to $15. I guess our link helped shift a few.